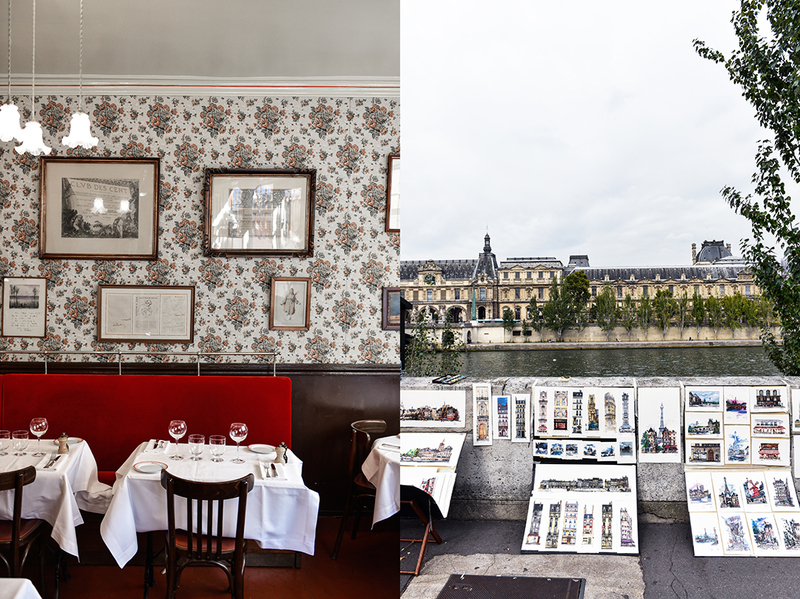 In 1932, Madame Marthe Allard decided to open a restaurant in Paris, Chez Allard. It is the beginning of a story deeply woven into traditional French country cuisine, a story of resolute women who love to cook, who master French classics to perfection, and passionately share their creations on Rue Saint-André des Arts, in the heart of the lively St German-des-Prés, until today. You could call Chez Allard a gourmet bistro, cozily elegant, the flaming red benches and wooden chairs in front of floral wallpaper filled with happy guests for more than 80 years. 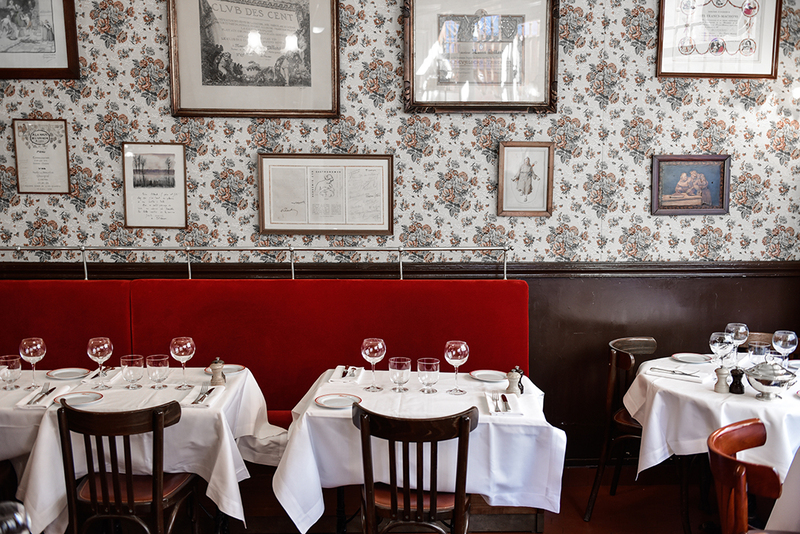 The interior barely changed, and so did the dishes on the menu, there’s still a strong focus on many of Madame Allard’s original family recipes from Burgundy, passed from one woman to the next. As soon as her son’s wife, Fernande, joined the family, the chef didn’t hesitate to introduce the young woman to all her kitchen secrets, and so the next generation was secured. 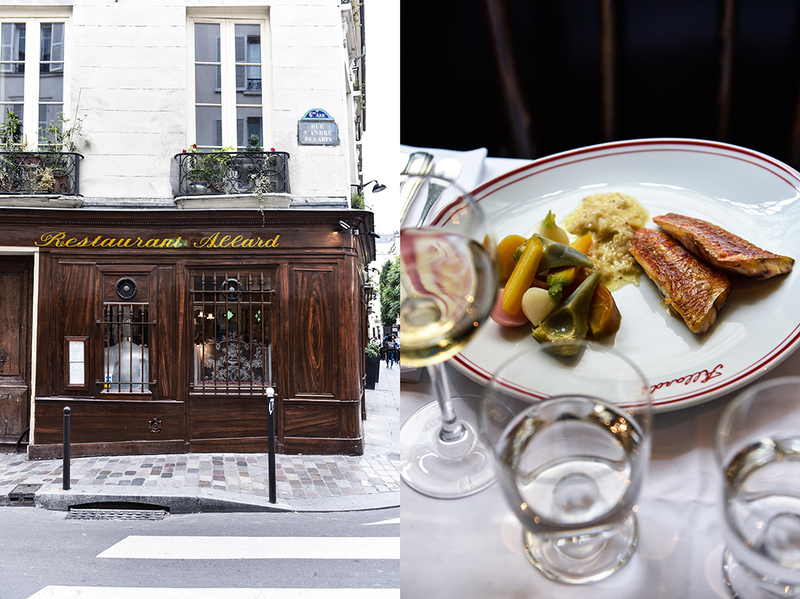 Marthe Allard stayed in the small kitchen on Rue Saint-André des Arts all her life, for more than half a century, tweaking and refining her famous rustic staples, like Challans Duck with Olives or Sole Meunière. After decades of female power at the cooker, there was finally a man in charge for 20 years, but when Alain Ducasse took over the restaurant, he knew he’d pass the reign to a woman again. Chez Allard has a female spirit, a female soul, Chez Allard is a woman. 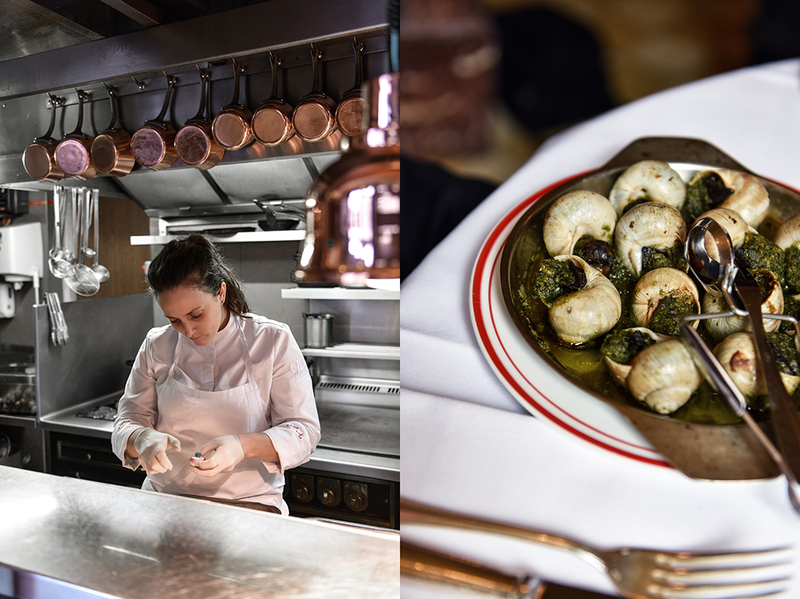 Since 2015, Fanny Herpin has been responsible for keeping the restaurant’s tradition alive, the recipes that became “old culinary friends” to so many guests. 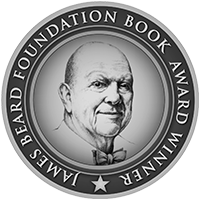 The young and celebrated executive chef manages to incorporate this history and at the same time giving it validity 80 years after the first pages of Allard were written. Fanny is calm, quiet, but she’s a woman you shouldn’t underestimate. Her instructions are short and precise, she’s charismatic. 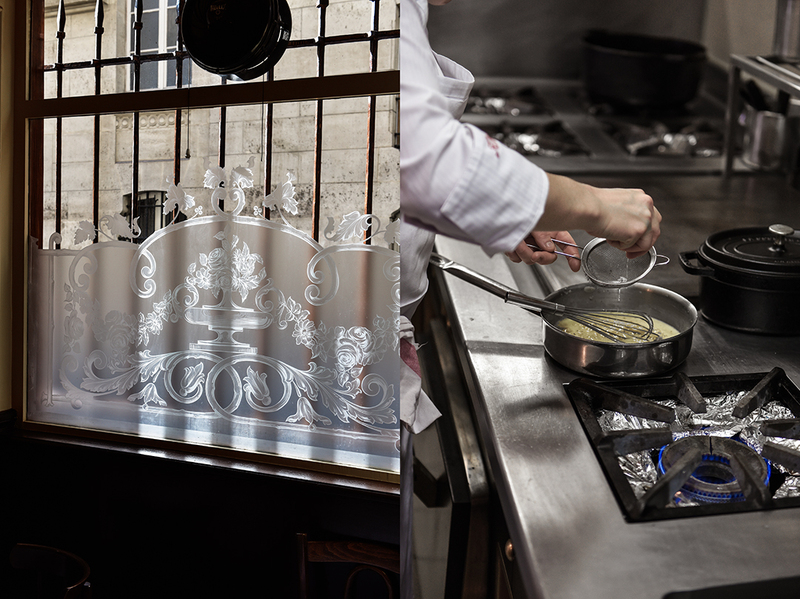 When you open the ornate glass door to the restaurant, you stand right in front of Chez Allard‘s heart, the kitchen. The room is open and there isn’t much space to move, this kitchen has to work smoothly and there’s no doubt that Fanny accomplishes this task with grandeur. Fanny Herpin is from Bordeaux, like Alain Ducasse, they even learned at the same culinary school. Both of them feel the same strong connection to their home region’s famous cuisine and products and have many of them freshly brought to the restaurant every day, like the fois gras on Allard‘s menu. When Fanny talks about food, or when she peels carrots with the precision of a scientist, you can feel her love, her passion, her obsession with quality. When she discovered the wonders of cooking and baking, she was hooked. Alan Ducasse was always her idol, she studied his recipes, she dove deeply into the magic that he’s been creating for decades. So when he called her to ask if she’d like to fill the position at Chez Allard, she was just 26, she remembers, “It was a big day, I didn’t believe it was possible. I asked are you sure, me?” She says that she’s still a little bit nervous when he comes and visits her at the restaurant. There’s a humble heart inside this strong, inspiring woman. 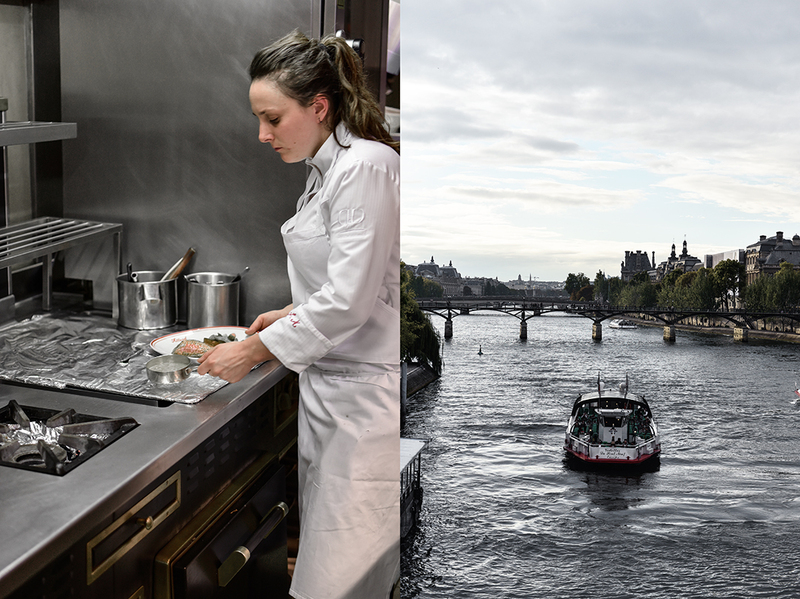 The dish that she cooked together with us felt like a bite of Paris, her Petits Rougets Barbets au Beurre Blanc (red mullet with a buttery, vinegary shallot sauce and sautéed root vegetables) was as pretty and perfect as the city that it was made in. For the Beurre Blanc, in a medium saucepan, bring the shallots, vinegar, wine, and mignonette pepper to a boil over medium heat. Reduce the sauce gently and gradually add the butter, stirring and whisking constantly to combine the sauce and the butter. If you add too much butter at once, the sauce won’t bind. Adjust the seasoning and add a dash of lemon juice; set aside (at room temperature). For the vegetables, peel the turnips, carrots, celeriac, and green radish. Cut the celeriac into diamond shapes, the green radish and turnips into “half moons”. Scrape and rinse the red radishes. Bring a medium pot of salted water to the boil. Rinse the leeks and blanch until soft. Transfer to a bowl filled with ice water, immerse quickly, and lay on paper towels. Cut the leeks into strips. In a large heavy pan, heat the olive oil over medium heat and sauté the vegetables separately for about 1-2 minutes. Transfer all the vegetables to the pan and season with salt and pepper. Add the garlic, thyme, and broth, cover the pan, and cook until soft. Before serving, add the butter, stir to glaze the vegetables, and season with salt and pepper to taste. For the fish, season the mullet fillets with salt and pepper on the meat side. Heat a splash of olive oil in a large heavy pan over medium-high heat and sear the fillets, skin side down, for 4 minutes or until the fish is done, the skin should be lightly crispy. Flip the mullets over, then transfer to a grid and set aside. Arrange the mullet fillets, slightly overlapping each other, on one side of the plate, the vegetables on the other side, and a spoonful of the Beurre Blanc in the middle. Serve immediately. Can you tell us a little bit about what you do and who you are? My name is Fanny and I’m from Bordeaux. I’m 27 and I’m Head Chef at Allard, a restaurant from Alain Ducasse. In which part of France did you grow up? Where did you spend your childhood? In Bordeaux, in the southwest of France. I studied there and afterwards, I left to Paris. Did the cuisine of Bordeaux influence you a lot? Yes, yes, yes, of course! The food in Bordeaux is very important for me. There is the foie gras and the duck. My mother was always cooking at home with my family, so I have a big influence from there which is always there when I cook, both at home or in the restaurant. Do you get products from Bordeaux for Chez Allard? Yes, the foie gras, for example. I was at the same school as Alain Ducasse in Talence. We attended the same culinary school. So, I know that the products are also important for him. How old were you when you started your career? Did you always know that you wanted to become a chef? Yes, yes, because I like to eat! Since always! At home, I was always cooking but more sweets, like cakes and everything. I did culinary training when I was 22 – just one week! – and I was sure. And that was the moment that you decided no more sweets, but cooking, more savoury cooking? Do you still do sweets sometimes? Sometimes, but just at home. Because it’s very different: pastry and cooking. It’s two different jobs. Why did you want to become a chef? Was it just because you loved to eat so much or did you meet other chefs that inspired you? Yes! Alain Ducasse, of course! When I was at school and I was starting to learn, I read a book about Alain Ducasse – the big book with all the recipes – and I knew that he has a lot of restaurants in the world: the bistro and the 3 star Michelin restaurant. So, I asked to do a culinary training in his restaurant. I did it and after that I was sure that I wanted to become a chef. I really like to manage people. It’s like a family that works together. It’s a lot of work but it’s my passion. I love to do it! I want to do it for the rest of my life. When you started, did you ever dream that one day you would be here? That you would be the chef at Allard? Of course I did, but I was thinking maybe after I’m 30. But I became the chef here at 26. It was really fast! How did you feel when he called you and asked you to become the Head Chef? (Laughing) It was a big day! I didn’t believe it was possible. I was working in London and he asked me to come here to take the position. I said, “Are you sure? Me?” He said, “Yes, come!” So, I came here one weekend, I saw Alain Ducasse, and we talked about the position here and… let’s go! One month later, I was here and I started work. I have a lot of support because it’s a big company. I am not alone. I’m the head chef for this restaurant but I have other head chefs above me so I am never alone. I always have someone to help me, to support me, if I want it. For that, it’s super! Does Alain Ducasse come here often to see if everything is going well? Yes, of course. He comes sometimes to spend time with friends, but he comes for work, too. Does it make you nervous when he’s here? A little bit, of course, but that’s normal. I’m always impressed by him when he’s here but it’s always a good moment. Chez Allard has a very strong line of female chefs. It was founded by Madame Allard who passed the recipes on to her daughter-in-law who took over from her. There was a female chef before you and now you’re here. Do you think that this restaurant has a female spirit or a female soul? Is Allard a woman? Yes, it’s tradition! Marthe Allard started to cook here. After her, it was Fernande. 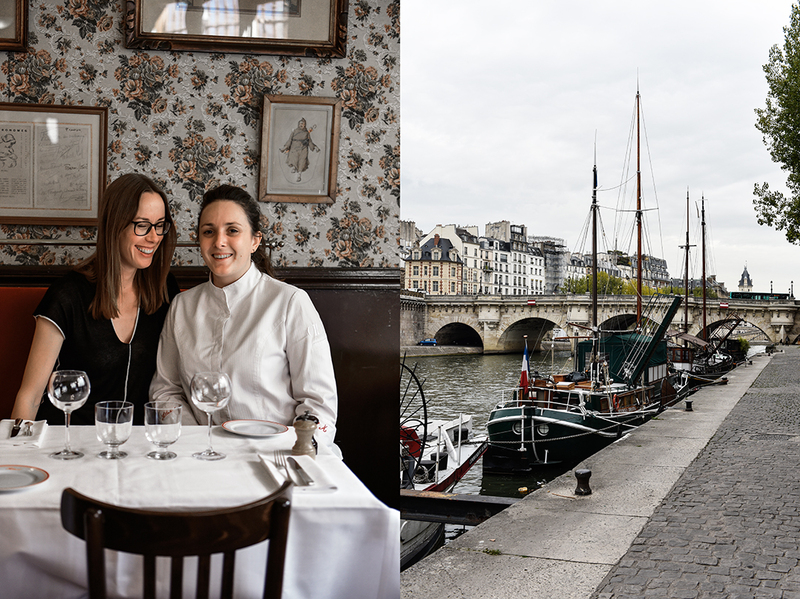 When Alain Ducasse took over the restaurant, he said, “I want to keep this tradition because it’s strong.” Laetitia Rouabah, the chef before me, worked here for three years before they asked me to take this position. It’s very important to keep the tradition. When people come here they say, “there have been female chefs here for a long time.” It’s very strong identity. For me, it’s also very important to keep that spirit. 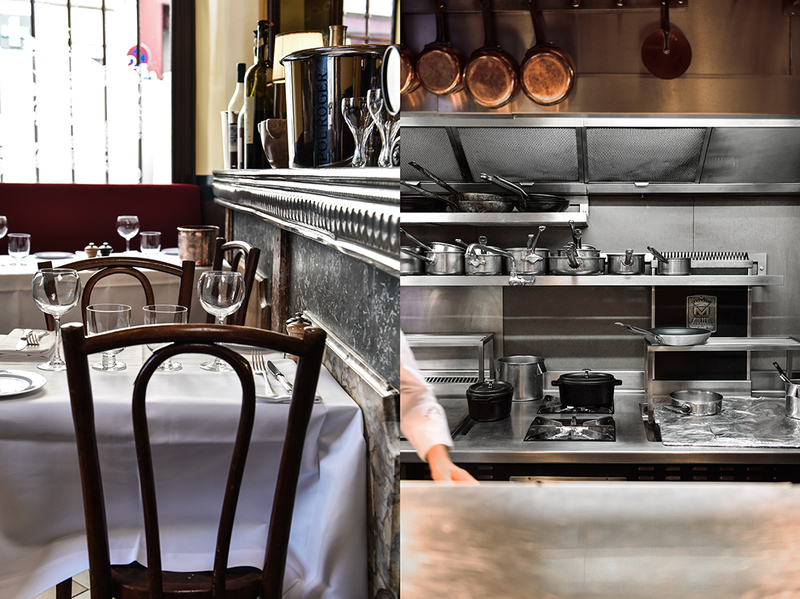 Is there a difference between men and women running a restaurant in the kitchen? Does it feel different? I don’t think so. It’s not about men and women. It’s just about the person and their personality. We’re all different. 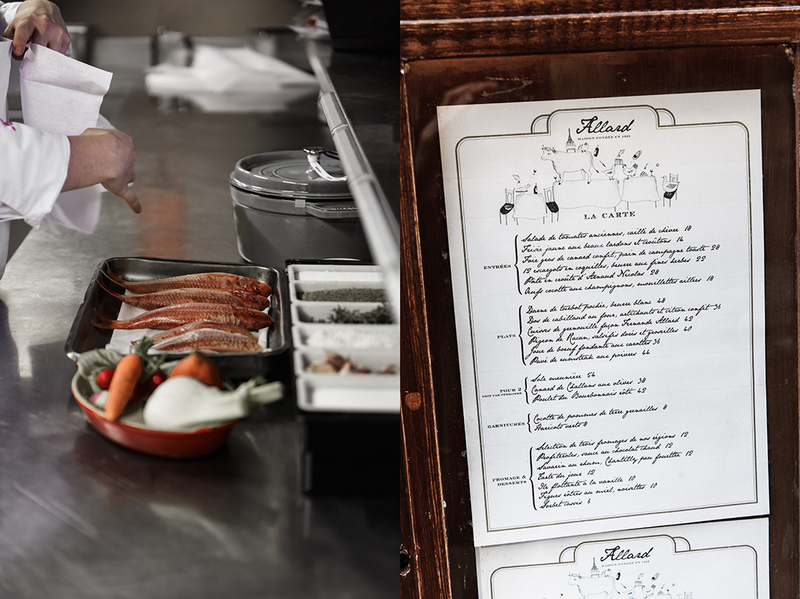 There are a lot of traditional recipes on the menu that Madame Allard invented or came up with – so how much of Alain Ducasse is in the recipes here at Allard? 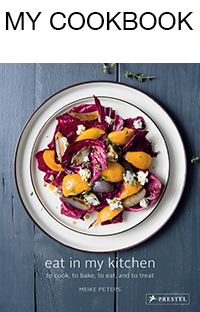 We keep and use all the recipes, but Alain Ducasse brings less sugar, less salt, and less fat to the recipes. That, for Alain, for all his restaurants, is the way to think and to work now. I keep a menu throughout the year, but some dishes I change according to the season. For example, we have just started to introduce root vegetables and pigeon to the menu. In the summer, it was tomato salads and raw fish. We change the menu every two or three months, depending on the season. It’s now! (late summer) Yes. The pigeons, and all the different birds – it’s a very exciting time. Yes, of course (laughing)! I really like this city because there are a lot of different restaurants: bistros, Michelin restaurants, and also there are a lot of small restaurants with different food and cultures. So that’s interesting for me. And it’s a beautiful city. You can walk everywhere – it’s beautiful. Do you go to restaurants a lot? Yes, sometimes. I try to go once a week. Can you go out and eat at a restaurant and just relax and enjoy it? Or do you analyse the food? No, I’m always thinking but it’s less than before (laughing). Before, I was too hard! Healthy food, for me, is when you use good products, produced in a way that respects the environment, and when it’s good for you, for the body, for your health. Voila! What is your greatest kitchen hack? Yes, actually I have something very important for me. It’s when you cook meat, you must let it rest. If you cook the meat for 10 minutes, then you let it rest for 10 minutes. This way, the meat is soft. If you could choose one person to cook a meal for you, who and what would it be? Alain Ducasse? (Laughing) No. It would Laurent Garnier because I’m a BIG fan. Maybe a dessert, like a chocolate cake, something easy and good. If you’re going to have 10 friends over for a spontaneous dinner, and you don’t have much time to plan or go shopping, what will be on the table? Foie gras toast! (Laughing) It’s easy! Do you prefer to cook on your own or together with others when you’re at home? Alone, I think, because I can do what I want. When there are a lot of people in the kitchen, it’s like my job here. I do that every day. I always have to check everything and to be everywhere. So, sometimes I really like to cook alone, just me in the kitchen, to relax, and to take the time to cook. Do you prefer improvised or planned cooking? Again, at home in your own kitchen. So even when you cook at home you always know exactly how you’re going to do it? Of course! I always know what I want to do – I have everything in my head. Sometimes, at home, if I’m missing an ingredient, it’s ok. I can remove it. Here at the restaurant, it’s not possible, but at home, I can change it. But there’s always a plan? Yes. Always. I’ve always worked like that! Thank you very much, Fanny!